← Review of Alberta Energy Regulator complete by end 2015, says energy minister Marg McCuaig. Did Encana create the conclusions? AER & Encana Lying Update: Encana’s Deadly Sour Gas Blow Out at Fox Creek: Did Alberta’s Energy Minister lie for Encana & “No Duty of Care,” cover-up agent extraordinaire, the AER? Small amounts of sour gas detected in the air around a blowout at a northern Alberta natural gas well are so minimal they pose no risk to human health, an Encana spokesman said Tuesday. [Is it wise to trust or believe fresh water aquifer-fracing, lying, cover-up Encana? WHY IS THE PRESS PUBLISHING ENCANA LIES ABOUT DEADLY SOUR GAS? “Our readings continue to be well below levels that pose a risk to human health,” said Jay Averill with Encana…. Encana’s air monitoring units detected three parts per billion of hydrogen sulphide, also known as sour gas, one kilometre from the blowout site. The well’s leak remains out of control. But Averill said workers can work for eight hours with an exposure of 10 parts per million — or 10,000 parts per billion — without any symptoms, according to Worksafe Alberta. A person will start to feel effects from hydrogen sulphide exposure at 20 to 50 parts per million. A natural gas blowout continues to spew [sour] natural gas and condensate in northwest Alberta. ‘Everybody is safe, so that’s the good news, Alberta Energy Minister Marg McCuaig-Boyd said following a gas well blowout near Fox Creek. Hartle said that amount of H2S in the atmosphere is low. McCuaig-Boyd hadn’t been updated on the test results early Tuesday morning when she said there “was no discernible H2S in the air.” [IF THAT IS TRUE, WHY DID THE ENERGY MINISTER GIVE THE PUBLIC FALSE INFORMATION ABOUT A DEADLY GAS?] She said more portable air monitors were being set up around the blowout site. The Alberta Energy Regulator learned about the blowout from a report about 2 p.m. Monday and has investigators on-site. As soon as the energy minister learned about the leak, McCuaig-Boyd spoke with the head of the energy regulator, the CEO of Encana and Fox Creek Mayor Jim Ahn. “You don’t want emergencies to ever happen, but Encana was well prepared so they have evacuated their staff,” [WAS ENCANA WELL PREPARED BECAUSE THE COMPANY KNEW FRACQUAKES HAD COMPROMISED THE WELLBORE CASING BUT WENT AHEAD AND FRAC’D ANYWAYS?] McCuaig-Boyd said. She said Encana shut roads, informed hunters and trappers in the area, and evacuated all personnel. She expects an update from Encana around noon Tuesday. Peter Murchland, spokesman for the Alberta Energy Regulator, said an inspector will work with Encana to determine what happened. Energy Minister Marg McCuaig-Boyd says no deadly hydrogen sulphide was detected in the air after a blowout Monday at an Encana natural gas well in northwest Alberta. “You don’t want emergencies to ever happen, but Encana was well prepared so they have evacuated their staff,” McCuaig-Boyd said. She said Encana shut roads, informed hunters and trappers in the area, and evacuated all personnel. She expects an update from Encana around noon Tuesday. This well was reported to have sour gas and was licensed as sour, but there is no discernable H2S content in the air? In the air where? By the well head, down-wind, up-wind, in the town of Fox Creek? What about the VOC levels, condensate is a very harmful and hazardous product. The Regulator and complicit parties have a way with sour gas emergencies, they cover it up. Look what happened at Lodgepole, review the distances of emissions impact, the harm it caused people and how the regulator handled the incident. Fox Creek is an industry town, I hope for the sake of the children, the elderly and pregnant women, there is someone using their PPE equipment to make sure the conditions are safe for the local popluation. The AER and Encana should be providing real time data from the trailer they have set up in town and from the monitors they would be regulated to have on and off site, under Directive 60, for the residents of Fox Creek. They should also update the volume of the blow-out, that has not been changed since yesterday afternoon. Summary: Uncontrolled sour natural gas and condensate release from a well occuring during well service operations. All personnel have been evacuated from site, and road blocks are in place. No residence in the immediate area. Encana is currently assessing the situation and formulating plans to bring the well under control. No reported impacts to any water body or wildlife. [KEY WORD IS “REPORTED.” WHICH OILFIELD WORKERS WILL DARE REPORT DEAD WILDLIFE TO ANYONE? WHY IS ENCANA ASSESSING THE SITUATION THEY CAUSED? Summary: Company called in a release from a sour natural gas pipeline. The pipeline was quickly shut in and all 3 wells associated with the line break have been shut in. The area is remote and access is only available by ARGO. Approximately 2 × 103 m3 of gas was released to the environment. The winter road access will be completed by December and the line will be uncovered in January for repair. No reported impacts to wildlife or waterbodies. The picture tells all Diana….”what would I know, Im just the office figure head whos going to tell the industry what to do”…. Our first priority was to ensure the safety of all personnel. We quickly secured the area around the site and confirmed that all staff were safe and accounted for. As a further safety precaution, we established roadblocks in the vicinity to maintain a safe distance from the site of the incident. In parallel we notified relevant stakeholders, including the Alberta Energy Regulator. [IS THIS THE JON STEWART SHOW?] There are no residences in the immediate area. We quickly put air monitoring equipment in place and so far we have not detected sour gas levels that pose any risk to human health, [SINCE WHEN DOES ENCANA TELL THE TRUTH WHEN THE COMPANY SCREWS UP?] however; we are being very cautious about the potential presence of H2S and will continue to monitor air quality until we regain control over the well. Emergency responders began arriving on site yesterday afternoon. With Encana Ex-VP Gerard Protti Chair of the AER, will the public and residents of Fox Creek ever find out the truth? 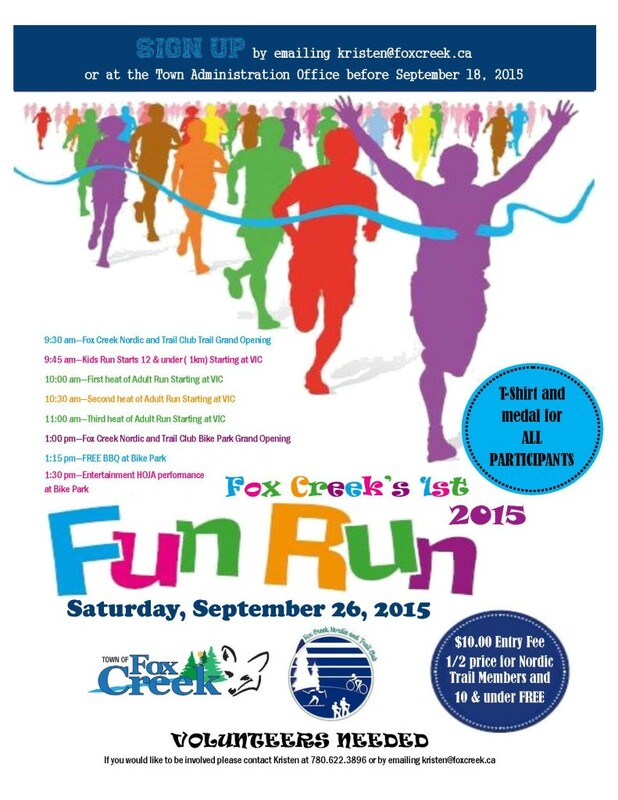 Fox Creek Fun Run in Encana’s Sour Gas Anyone? AER Responding to Encana Sour Gas Well Blowout in AER’s blanket approval, fracing free-for-all near Fox Creek. Was it caused by what Mayor Ahn fears? Fracquakes?